Barrett's oesophagus (BO) is the only known precursor to oesophageal adenocarcinoma (OAC). Dysplasia and intramucosal cancer arising in BO can safely be treated with endoscopic eradication therapy (EET) due to the low risk of subsequent lymph node metastasis. Treatment at an early stage is paramount due to the ongoing poor prognosis and outcomes of patients with advanced OAC. The mainstay of treatment is endoscopic resection of visible lesions for accurate staging followed by ablation therapy to all remaining columnar-lined epithelium, most commonly with radiofrequency ablation. Successful eradication of dysplasia can be achieved in >95% of patients with this EET combined approach. The UK has one of the highest incidence of oesophageal adenocarcinoma (OAC) in the world.1 OAC has a poor prognosis, with <20% of patients surviving at 5 years.2 An important factor driving this poor survival is the late presentation of the disease. 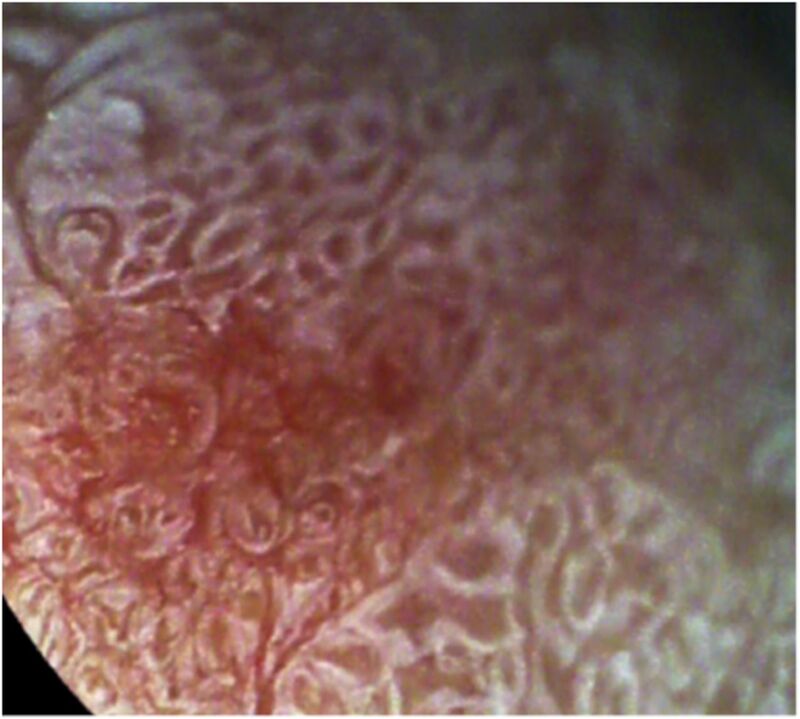 Early detection of lesions in BO is essential to drive any subsequent endoscopic treatment options. Visualisation of subtle mucosal lesions can be enhanced with novel wide-field imaging technology that can be used on the entire oesophagus to highlight areas of interest including acetic acid chromoendoscopy and virtual chromoendoscopy (summarised in table 1). Both narrow band imaging (NBI) and i-Scan technologies can be combined with magnification endoscopy, which allow areas of interest to be viewed with up 136 times magnification. i-Scan magnification endoscopy to demonstrate the loss of whitening after application of 2% acetic acid in dysplastic Barrett's oesophagus. Radiofrequency ablation of Barrett's oesophagus. Circumferential Barrett's oesophagus prior to ablation (top left), placement of the 360 balloon catheter (top right) and following ablation (bottom left). Focal devices are also available (bottom right) (with permission from Medtronic). APC uses argon gas to conduct electrical current to thermally ablate targeted tissue. APC is often used as an adjunct to alternative therapies, as it is cheap and easy to treat small areas of residual disease and has been demonstrated to significantly increase recurrence-free survival for the patients undergoing ablation after EMR compared with those having EMR alone.37 A feasibility study comparing APC with RFA recently reported preliminary findings that suggested that at 12 months there was no difference in CR-D rates.38 However, there are still no large volume data to support APC as first-line ablative therapy for patients with BO neoplasia and further studies are required in this field. The development of endoscopic tools to improve the diagnosis and management of patients with Barrett's dysplasia is on-going and evolving rapidly. Several technologies are currently in clinical trials to assess their efficacy. Autoflouresence (AF) is a virtual endoscopy technique using the variable quantities of fluorophores (substances that emit fluorescent light after exposure to short, blue light wavelengths). Alterations in the autofluorescence pattern of neoplastic tissue is translated into false colour images, usually depicting neoplasia in purple against a green background of healthy mucosa. AF has been integrated with high definition white light endoscopy and NBI as part of the ‘endoscopic trimodal imaging’ system. Optical coherence tomography (OCT) uses reflected light in a manner similar to acoustic ultrasound to generate high-resolution three-dimensional images. This allows ‘visualisation’ of the mucosa to a depth of 1–2 mm. 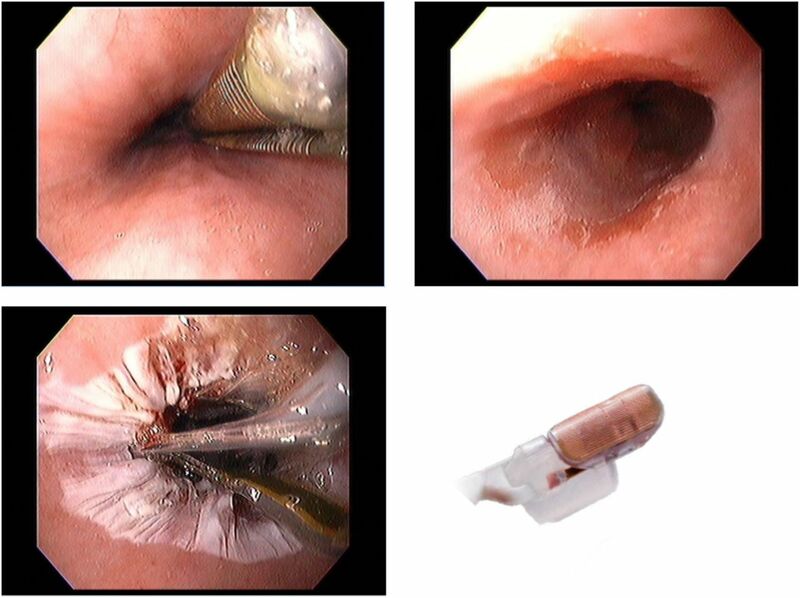 Currently performed with a probe through the working channel of an endoscope, the future may involve tethered capsule technology (where capsules attached to a string are swallowed and then retrieved) and rapid assessment of the tubular oesophagus. Recent studies have suggested a role for OCT for surveillance after ablation therapy with radio-frequency ablation. Cryoablation uses liquid nitrogen to form intracellular and extracellular ice that causes ischaemic necrosis on thawing and apoptosis of the treated cells. Previous limitations of cryotherapy included the large volume of gas produced during therapy; however, a new focal balloon device avoids this risk using a self-contained unit that does not introduce gas into the stomach (Cryoballoon Focal Ablation System, C2Therapeutics, USA). The management of Barrett's-associated dysplasia has changed dramatically in the last 10 years. Our continued understanding of which lesions are amenable to EET means that we can confidently offer a long term curative treatment to the majority of patients with early disease and avoid disease progression and the need for surgery for these select patients. Meticulous lesion recognition with combined high-quality endoscopic imaging modalities followed by endoscopic resection and ablation with RFA remain the foundation of treatment for most patients. Advances in optical imaging for diagnostic and surveillance purposes coupled with new interventional technologies such as cryotherapy may further improve outcomes and allow us to treat a wider cohort of patients.
. National oesophago-gastric cancer audit. Health and Social Care Information Centre, 2015.
. Ablation of residual Barrett's epithelium after endoscopic resection: a randomized long-term follow-up study of argon plasma coagulation vssurveillance (APE study). Endoscopy 2014;46:6–12. Contributors Both authors have contributed to the writing of this article.